French lawyer; younger brother of Emile Worms; born at Luxembourg Nov. 16, 1853; educated at Paris and Rennes ("docteur en droit," 1878). 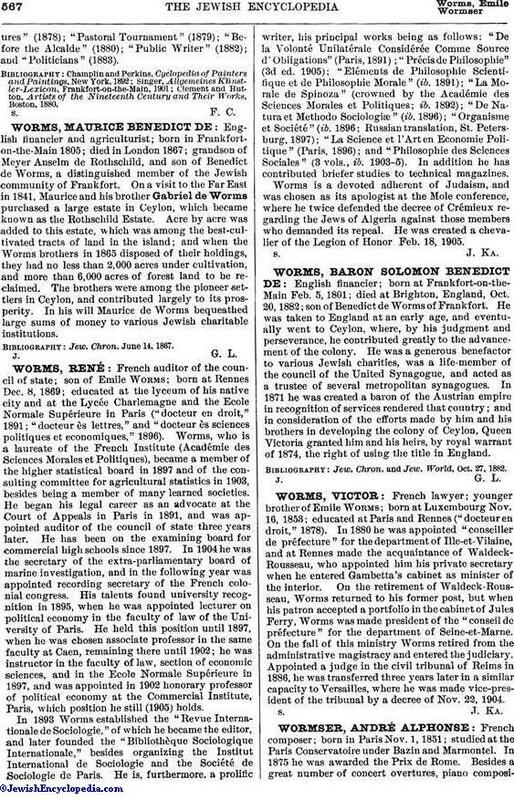 In 1880 he was appointed "conseiller de préfecture" for the department of Ille-et-Vilaine, and at Rennes made the acquaintance of Waldeck-Rousseau, who appointed him his private secretary when he entered Gambetta's cabinet as minister of the interior. On the retirement of Waldeck-Rousseau, Worms returned to his former post, but when his patron accepted a portfolio in the cabinet of Jules Ferry, Worms was made president of the "conseil de préfecture" for the department of Seine-et-Marne. On the fall of this ministry Worms retired from the administrative magistracy and entered the judiciary. Appointed a judge in the civil tribunal of Reims in 1886, he was transferred three years later in a similar capacity to Versailles, where he was made vice-president of the tribunal by a decree of Nov. 22, 1904.